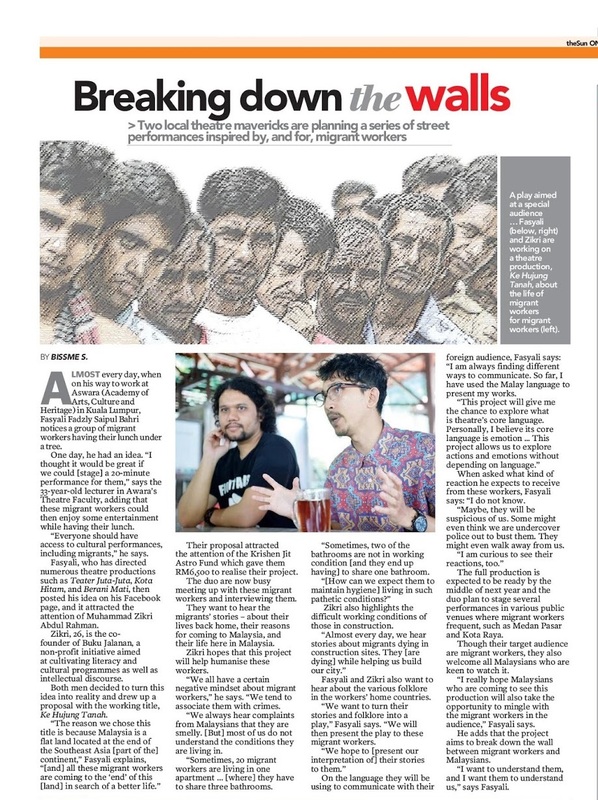 Fasyali Fadzly and Muhammad Zikri tell theSun about their interesting project named Ke Hujung Tanah where they are keen to stage several theatre performance that tell the stories of migrants in Kuala Lumpur. Almost every day, when on his way to work at Aswara (Academy of Arts, Culture and Heritage) in Kuala Lumpur,Fasyali Fadzly Saipul Bahri notices a group of migrant workers having their lunch under a tree. One day, he had an idea. “I thought it would be great if we could [stage] a 20-minute performance for them,” says the 33-year-old lecturer in Awara’s Theatre Faculty, adding that these migrant workers could then enjoy some entertainment while having their lunch. “Everyone should have access to cultural performances, including migrants,” he says. Fasyali, who has directed numerous theatre productions such as Teater Juta-Juta, Kotak Hitam, Berani Mati, then posted his idea on his Facebook page, and it attracted the attention of Muhammad Zikri Abdul Rahman. Zikri, 26, is the co-founder of Buku Jalanan, a non-profit initiative aimed at cultivating literacy and cultural programmes as well as intellectual discourse. Both men decided to turn this idea into reality and drew up a proposal with the working title, Ke Hujung Tanah. “The reason we chose this title is because Malaysia is a flat land located at the end of the Southeast Asia [part of the] continent,” Fasyali explains. Their proposal attracted the attention of the Krishen Jit Astro Fund which gave them RM6,500 to realise their project. their life here in Malaysia. Zikri hopes that this project will help humanise these workers. “We all have a certain negative mindset about migrant workers,” he says. “We tend to associate them with crimes. We always hear complaints from Malaysians that they are smelly. [But] most of us do not understand the conditions they are living in. having] to share one bathroom. Zikri also highlights the difficult working conditions of those in construction. Fasyali and Zikri also want to hear about the various folklore in the workers’ home countries. “We want to turn their stories and folklore into a play,” Fasyali says. The full production is expected to be ready by the middle of next year and the duo plan to stage several performances in various public venues where migrant workers frequent, such as Medan Pasar and Kota Raya. Though their target audience are migrant workers, they also welcome all Malaysians who are keen to watch it. “I really hope Malaysians who are coming to see this production will also take the opportunity to mingle with the migrant workers in the audience,” Fasyali says. He adds that the project aims to break down the wall between migrant workers and Malaysians. “I want to understand them, and I want them to understand us,” says Fasyali.